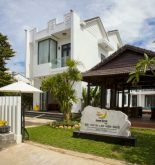 Windbell Homestay Villa is designed for both relaxing and business trips because it is located at an ideal position at Hoi An riverside where is one of the famous areas in city. It is distant the city center 1 km so it is very easy for tourists to approach the different destinations in city: Tran Duong house, Hoi An market which creates a special charming beauty. The Windbell Homestay Villa provides good equipment and services to ensure a comfortable vacation for tourists. When relaxing in this great hotel, tourists can enjoy beauty service, concierge, travel service, wifi in public areas, baby-sitting service. Especially, hotel has 12 beautiful rooms. Each of them has desk, free bottle of water, bathtub, hair dryer and shower. The list of recreational facilities equipped in hotel includes garden, massage, outdoor swimming pool, spa, swimming pool for children. 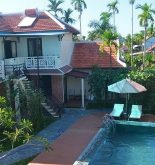 In spite of any purposes of coming Hoi An, Windbell Homestay Villa is always considered as a perfect choice for your vacation in Hoi An. Address: Chau Trung block, Cam Nam ward, Hoi An, Quang Nam, Vietnam. 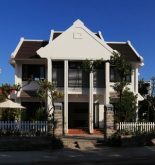 This information has been supplied by Windbell Homestay Villa.